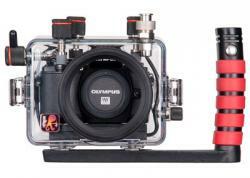 Aquatica has just announced a dome port to complement their new line of housings for Micro 4/3 cameras. Dubbed the SW8, the new dome port has been specifically designed for the super wide-angle lenses used on Micro 4/3 cameras, including the new Olympus OM-D E-M1 (see the Aquatica AE-M1 housing). 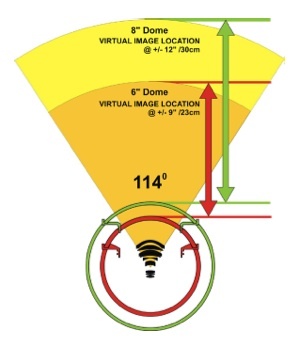 By using the curvature of the 8" dome to create a smaller dome, the minimum focus distance on the dome's virtual image is maintained. Normal 6" dome ports require a shorter focusing distance (than 8" dome), increasing depth of field and forcing photographers to stop down when shooting scenes like close focus wide-angle. MONTREAL, QC. - Along with its new line of housings for the Micro 4/3 series of Camera, Aquatica is proud to introduce the SW8 Port, specially designed to cover Super Wide Angle lenses such as the 114o FOV Panasonic Lumix G Vario 7-14mm F/4 and the 100o FOV Olympus M.Zuiko 9-18mm f/4-5.6. With these ultra wide angle rectilinear lenses, to get the best optical results, the use of a large radius dome port is required. To achieve the optimum quality over the whole image area, Aquatica uses its legendary 8’’ diameter dome port with an added twist. 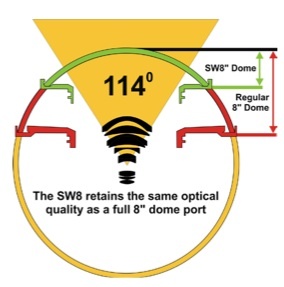 The SW8 port only uses the portion of the dome lens required to cover the field of view of these extreme lenses. Consequently, the resulting dome port is substantially smaller and lighter, while retaining the optical performance associated with these large hemispherical dome ports. Whenever a dome port is immersed in a liquid, it creates a Plano-Concave lens element of its own. 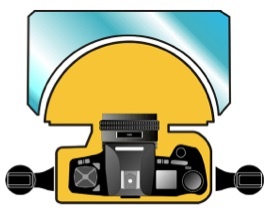 This additional lens element has the property of retaining the original field of view of the lens (as opposed to a flat port which will considerably reduce the field of view of a lens). One of the side effects of this optical phenomenon is that it creates a virtual image of the scene being photographed. This image is projected at 4x the radius from the optical center of the dome used. In other words, that scene is now projected at a much closer distance than it is in reality, and a lens will usually need to be focused close to its minimum operating distance. 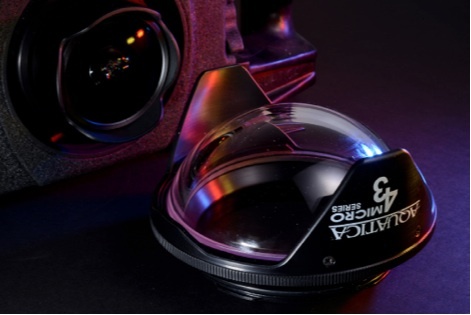 Using an 8’’ dome wraps the projected virtual image at +/- 12’’ (30cm) from the external surface of the dome lens, while a smaller dome port, such as one with a 6’’ diameter, will force this virtual image to be wrapped a mere +/- 9” (23cm) away. This might be a relatively innocuous difference of distance in normal situations, but it is also common knowledge that the closer the focusing distance, the harder it will be to get adequate depth of field. At these close distances, such small difference does have a huge impact on the success of the images taken. Once underwater, a dome port will force the light to radiate towards a central point. 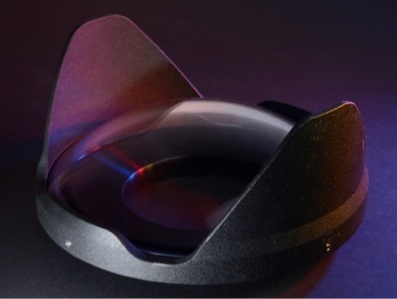 To obtain the best performance, this optical center should be located, as close as possible, where the optical center of the lens used is when set at its widest field of view. With the Aquatica system, a modular port extension system allows the SW8 port to be optically optimized to this position so that it can be used successfully with wide variety of lenses. To complement the SW8 port, Aquatica also offers its well established and renowned 4’’ BK-7 coated glass dome for the Panasonic Lumix G Fisheye 8mm f/3.5 lens, and for Macro work, two dedicated flat port for the Olympus M.Zuiko 60mm f/2.8 ED and the Leica DG Macro-Elmarit 45mm f/2.8. In keeping with the spirit of the housings it was designed for, the Aquatica SW8 port is compact, and because of its modular nature, its footprint in your luggage will be 1/3 the space than a regular 8’’ dome port would require. 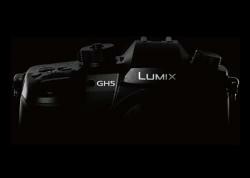 This should be a welcome relief for the travelling photographers. 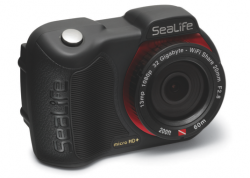 The SW8 Port is priced competitively at retail USD $579 and will be available in March 2014.